The garden was refreshed by gentle rain during the night. By noon today the grass had dried sufficiently for mowing, just in time too so visiting friends could wander around and linger in the garden. 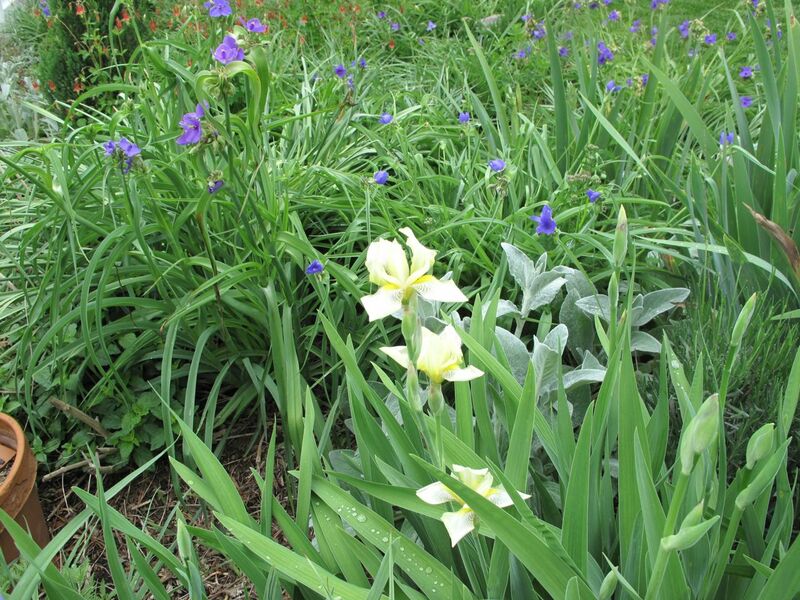 Several types of irises are blooming. 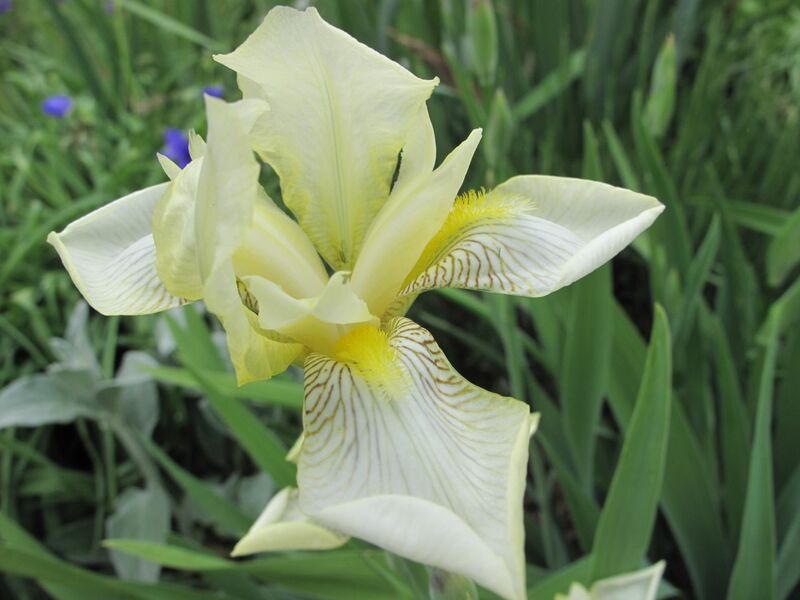 Newly opened today are the pale yellow Japanese Iris, pass-along plants from a special sister-in-law in Idaho. 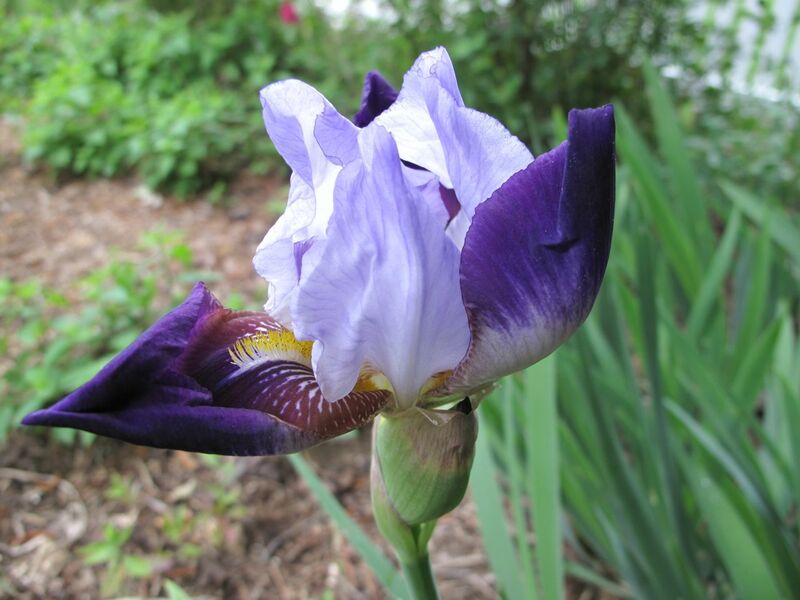 This iris with pale lavender standards and dark purple falls is another pass-along from a former neighbor. I brought this and the Japanese Iris from my first garden nearly eleven years ago to help form the foundation of this current garden. 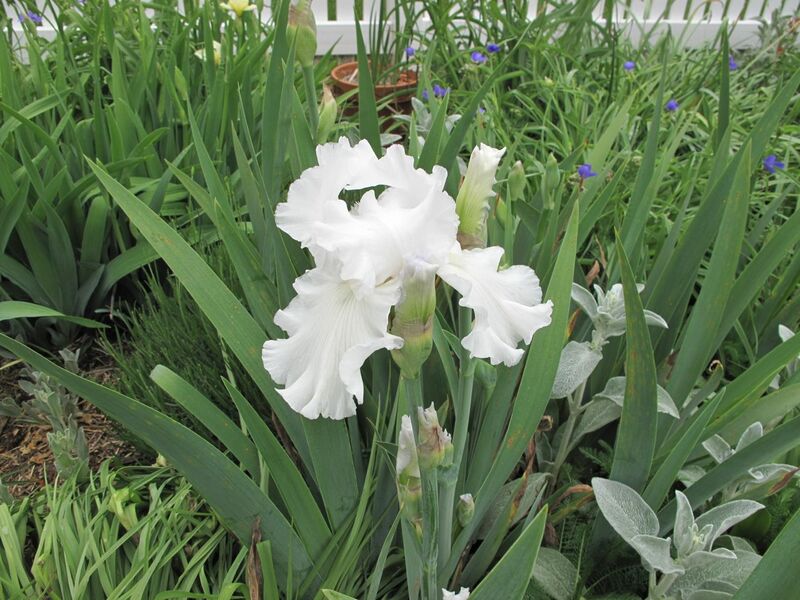 A more recent pass-along, this lovely white iris with very large flowers is from a gardening friend now serving in the Peace Corps. I did not realize the garden had this black iris but am thrilled to discover it. It must have come into the garden at the same time as the white one above. It promises to be gorgeous. 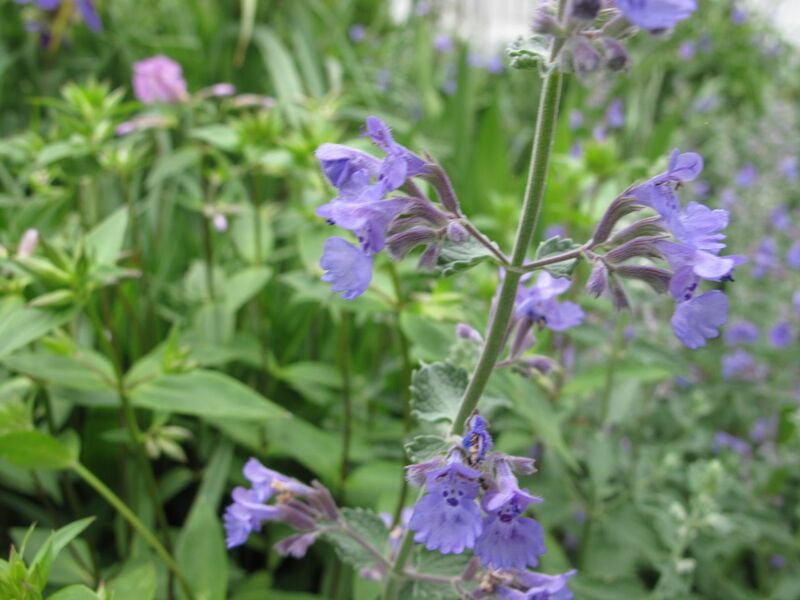 Pass-along plants bring memories of friends and neighbors, but precise identification of these is not possible. I simply remember them by the names of the donors. 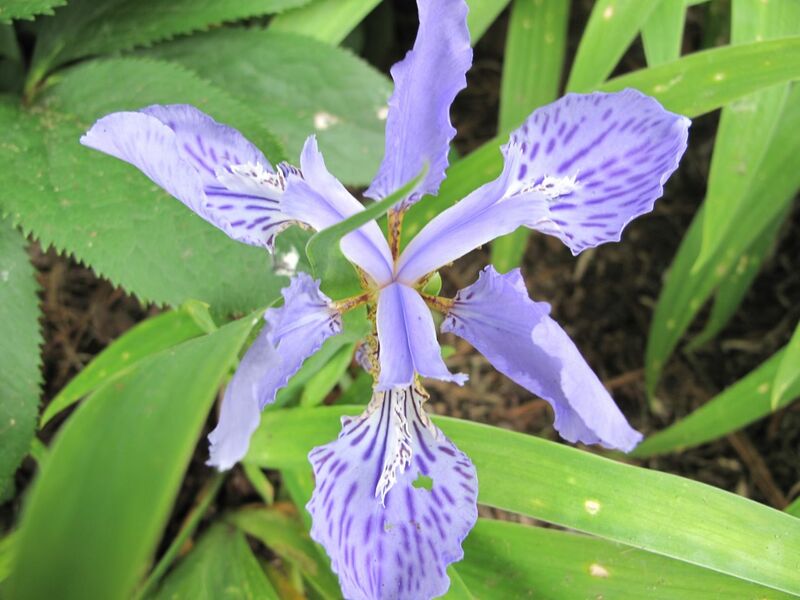 Here is another iris from my old garden by way of a dear family friend. 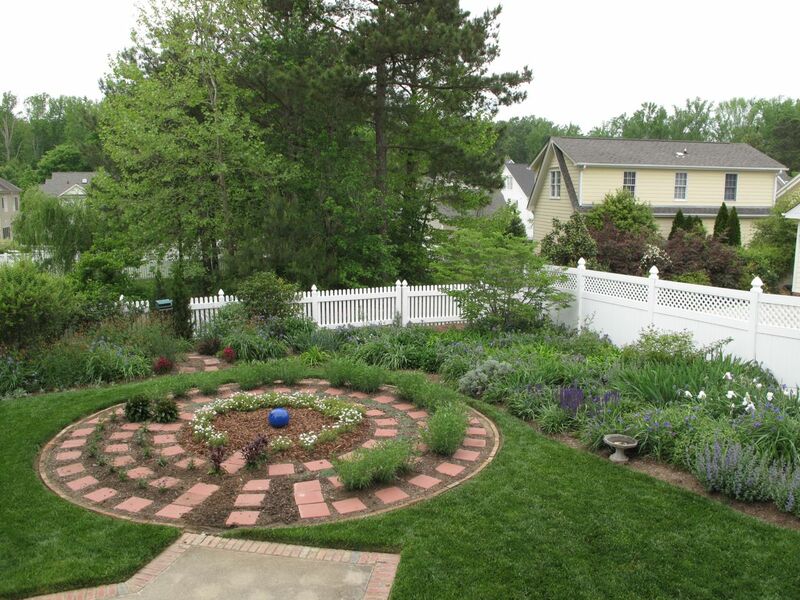 The meditation circle is a year old this week and the evergreen perennials that help define the walls of the labyrinth easily survived the mild winter. Iberis sempervirens ‘Purity’ (Candytuft) – Used in the innermost portion of the circle (goal of the labyrinth), currently this is ending a long bloom cycle that began December, 2011. 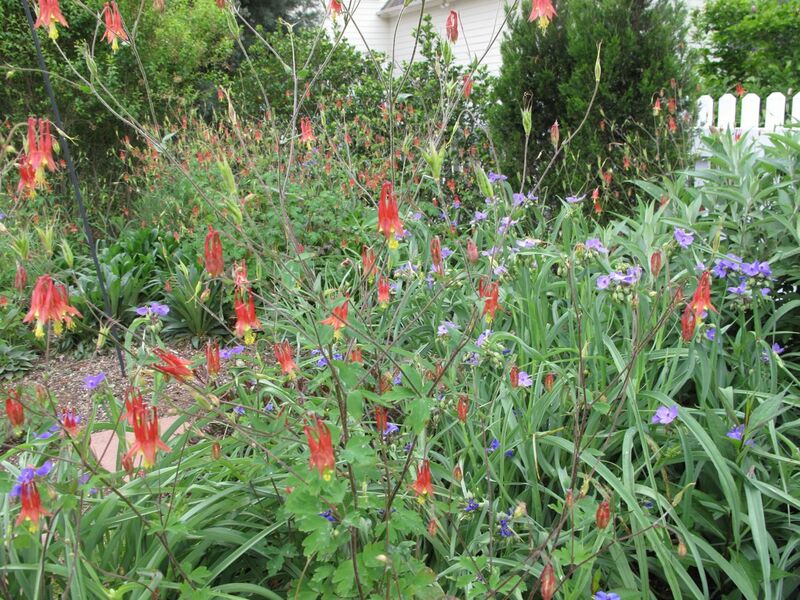 Penstemon digitalis ‘Husker Red’ (Beardtongue) – Two plants, used to define walls at one of the turn-around points, did so well that three more were added this spring. Self-sprouted seedlings from the original two are growing nearby and may produce some plants that can be added to the labyrinth, although references indicate that ‘Husker Reds’ from seeds will not have the same dark red leaves that plant divisions would. Thymus x citriodorus (Silver Edge Thyme) – Not thriving but doing ok. Conditions have been too wet for this herb, but the thyme is beginning to improve and look healthier. May gradually replace them after they bloom. Penstemon mexicali ‘Pike’s Peak Purple’ (Beardtongue) – This penstemon has a wilder look than the Husker Red and seemed scraggly last summer, but during fall and winter looked very green and strong. 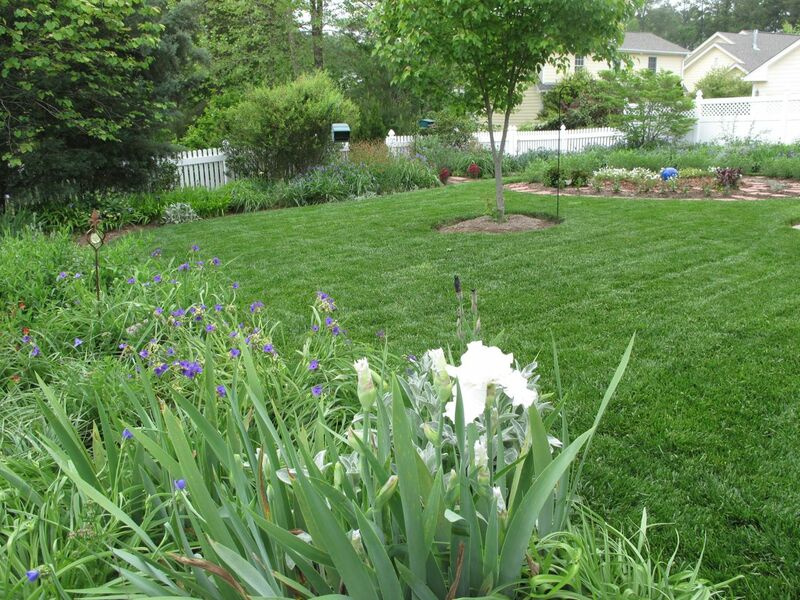 It was severely sheared in March and has returned with strong, lush look. This plant may become too wide and grow too far into the path. 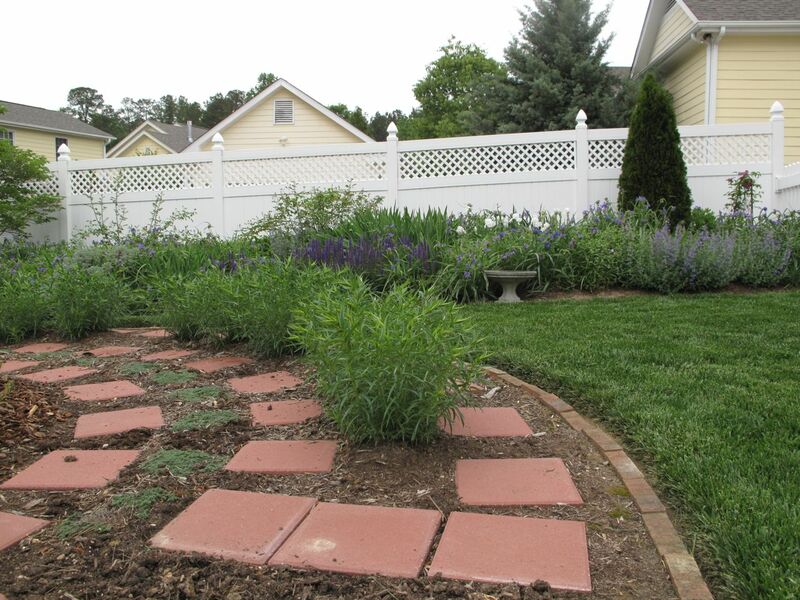 To complement the perennials, yesterday I added fifteen Angelonia ‘Blue’ between the two left-most paths. 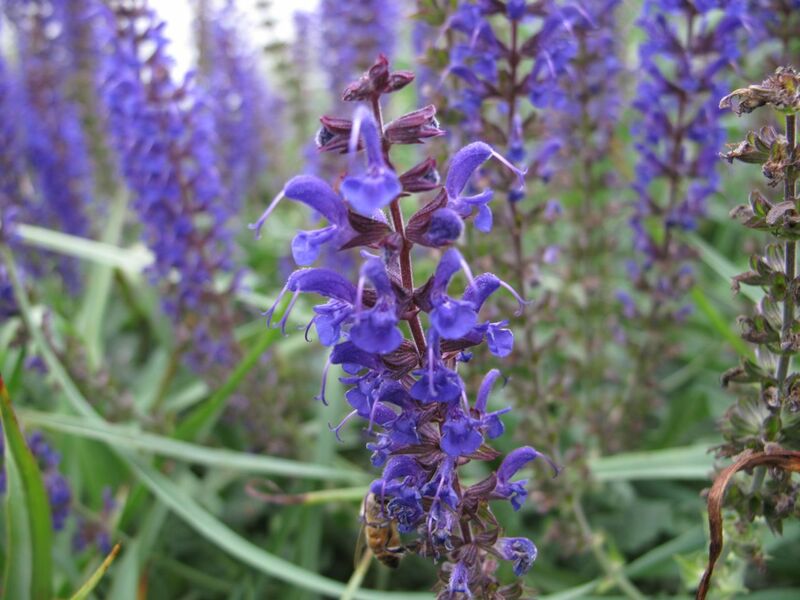 Angelonia are annuals that bloomed until October last year, providing a lush look for the meditation circle without much maintenance. 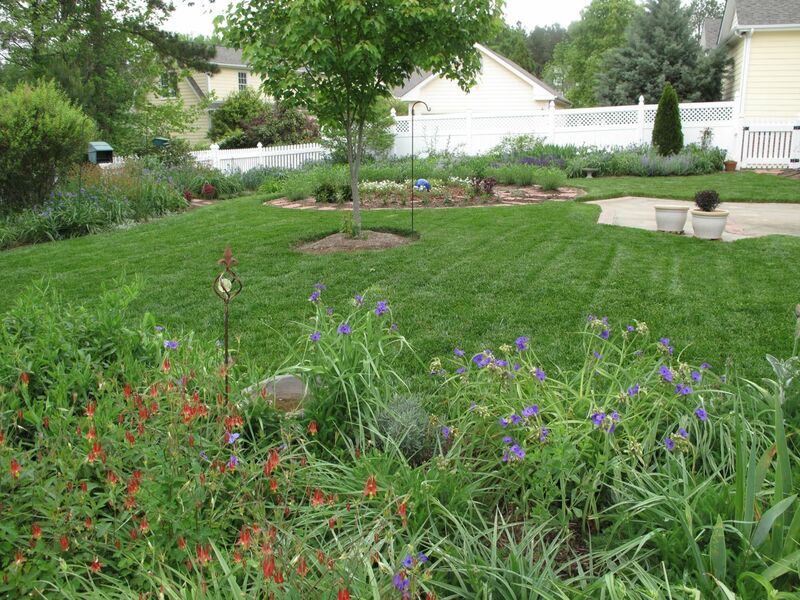 Angelonias tolerate heat and humidity, are deer-resistant and do not require dead-heading. They did outgrow the narrow 6-inch space between the paths and had to be trimmed back several times, but the cuttings made lovely and long-lasting indoor arrangements. 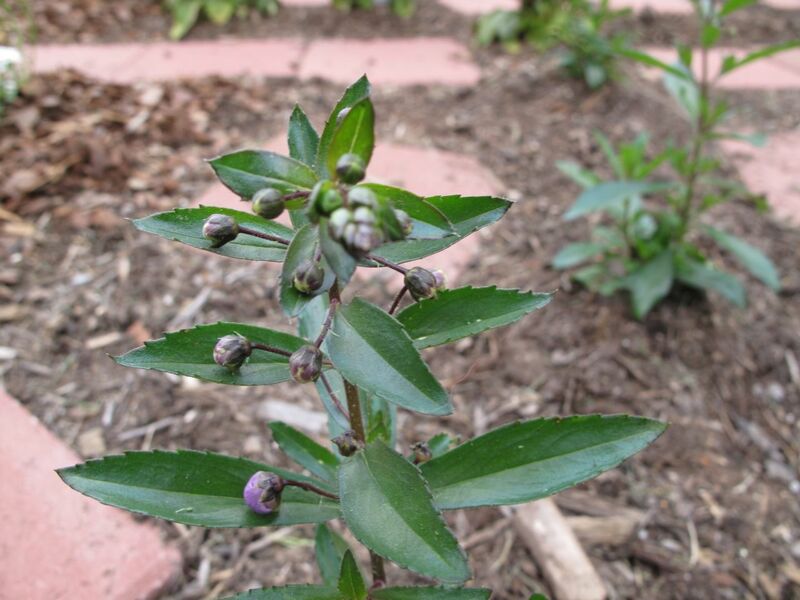 This entry was posted in garden and tagged can, iberis sempervirens 'Purity', iris, nature photography, pass-along plant, penstemon, photography, thyme on April 19, 2012 by pbmgarden. Beautiful Irises. I too have a black one, truely, truely black, I love it. I would like some other others too, maybe some yellow, orange and a white like yours for the large island bed, mine are all still tight buds, so something to look forward to. Thanks. I’d love to see your black one when it opens. Good hunting too–hope you find irises in those colors. That would make a lovely sight. 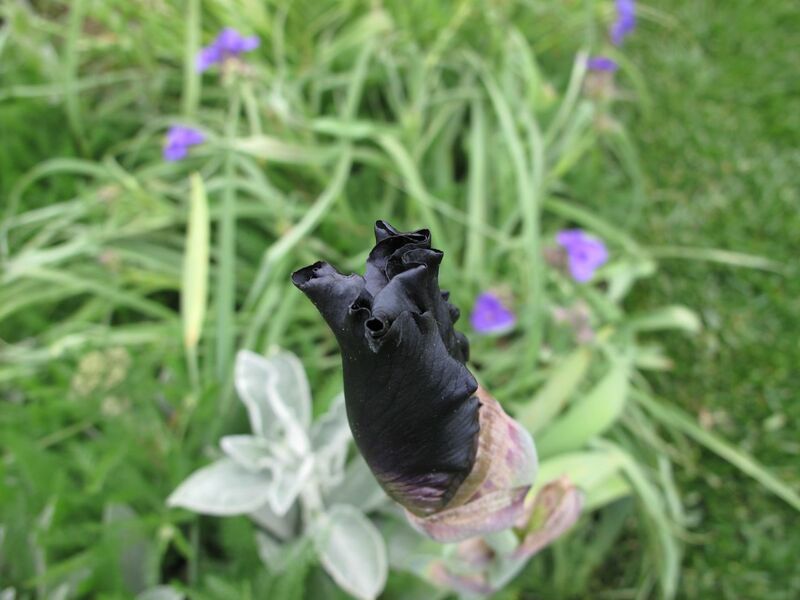 I have never seen a black iris… I hope we will get to see a photo of it when it has opened! I like the look of the Angelonia too. I’m excited to see it open myself and will definitely try to post a picture. Angelonia is terrific. 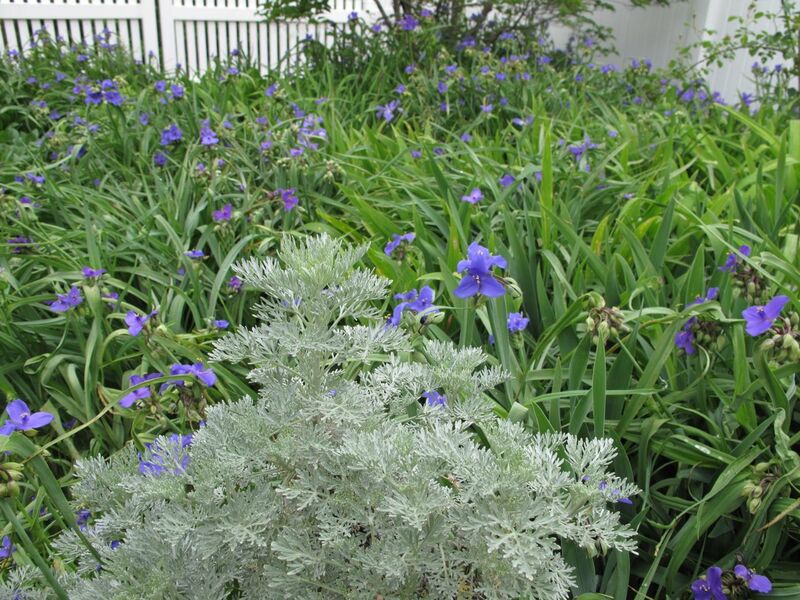 That black iris will be amazing when it comes out – make sure it features in a blog sometime. I’d love to see it. Thanks. Hope I can get some good pictures of the black iris to share with you.